"After their zoo was bombed, Polish zookeepers Jan and Antonia Zabinski managed to save over three hundred people from the Nazis by hiding refugees in the empty animal cages. With animal names for these "guests", and human names for the animals, it's no wonder that the zoo's code name because "The House Under a Crazy Star." 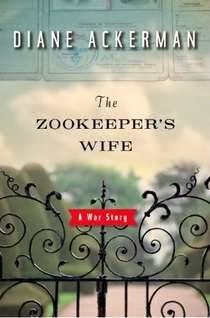 The Zookeeper's Wife is a true story (which instantly caused me to relax in relief over the fact that the book wasn't a modern novel!) and one well worth the reading time. I thoroughly engaged with it and enjoyed it (as much as ever one does with a true story about World War II). One of the reasons I enjoyed it being that Antonia and Jan were perfectly ordinary. Their story is sensational in respect to their being operators of the zoo in Warsaw. However, the zoo is shut down quite early in this book/story and what remains is a tale of ordinary people, living in extraordinary circumstances, who purposed to do the right thing even if it cost them their lives. All throughout the book, Walter would drop information about the Nazis or war conditions in Poland that I found particularly intriguing. As another example, she told of a Mrs. Walter who ran "a kind of charm school", instructing Jewish women on how to look, act, speak and cook like their Polish counterparts. I had no idea that that had been done! Our book club group's chief critique of the book was in the writing style. There was general agreement than Ackerman's style left a lot to be desired. She writes as a journalist trying to tell a long and compelling story and that creates for a very choppy reading experience. Ackerman had a tendency to bounce from narrative, to documentary-style quotes which was distracting. Also, she did not follow a strictly linear time frame when laying out the Zabinksi's story which left many of us questioning where we were in the narrative as related to their personal life experiences. However, despite this complaint, there was not a person in our book club who failed to enjoy the read on the whole. I feel safe in recommending this book to others. It is not an intense war story by any means. It is fairly tame and mild and I think that is appropriate given the fact that the tale revolves around a single family and their life. There is no language or violence (other than discussion of air raids and gun shots) but nothing gratuitous in the least. This is an informative and interesting read and I'm glad to have had it recommended to me. You can watch the entire short film/documentary Safe Haven: The Warsaw Zoo (for free!) by clicking on the title there. I can't say that it offers anything different than the book but you get to see some more pictures and that part is fun. Anyone reading the book might venture a guess that this book would be turned into a movie. If you guessed so, you would be correct! It will be made into a movie that is marked for a 2015 release. I have a date with a dozen friends to go and see it. And I look forward to that! I've heard good things about this. Sounds intriguing! Thanks for the recommendation, Carrie. I am not normally a fan of "war stories," but this one compelled me to add it to my list. I hadn't thought about it, but you are right. The use of "wife" in the title is usually a red flag. It's weird. I read this so fast and don't remember much except that I didn't like it. I feel like I need to read it again.